Just Romantic Suspense: If your dream date offered you slumgullion, would you eat it? If your dream date offered you slumgullion, would you eat it? Congratulations to "Denise Z. ", the winner of Kallie's giveaway. Thank you to all who participated. First off, I’d like to thank Just Romantic Suspense for inviting me to blog today. I love the opportunity to chat with readers, so let’s just tuck ourselves into this subject. Breeana came into the kitchen and elbowed Theo and Sully out of the way. She wanted to see what they were cooking. Whatever it was, it smelled awful. “Oh my gosh, it’s all I can do not to gag at the smell. You mean it’s what you eat when you’re living off the land?” she asked. “Well, yeah. It’s a variation, because the recipe is never the same,” Sully explained. He seemed so proud of his concoction; she almost hated to burst his bubble. “Hold it right there.” Breeana couldn’t take it anymore. If she didn’t get the putrid smorgasbord out of her kitchen, she wouldn’t be responsible for what her stomach did next. She grabbed the pot from the stove and pushed past Sully and Theo as she headed for the garbage cans at the back of the house. Without a word, Breeana hopped down the outside stairs, bumped the lid from the closest garbage pail and dumped the vile-smelling slumgullion into the inner bag. Then she took the pot to the outdoor tap and hosed it down. So I’ll ask you again. If your dream date offered you slumgullion, would you eat it? Look in your fridges right now and you decide. Personally I think even love has its limits! She's on a psychopath's radar, and only one man can help—a homicide cop with an agenda of his own. Two of her friends are dead and Breeana McGill can't believe their deaths were accidents. When homicide cop Sullivan Sauvage corners her, asking questions she can't answer, Breeana realizes she's in danger too. Sauvage tells her she must do exactly what he says if she wants to stay alive. Breeana resents his orders, but she can't ignore the attraction snapping between them. Sullivan knows there's a serial killer in Mallard Bay, and he believes Breeana is the killer's next target. But protecting her won't be easy. Breeana rattles and distracts him in ways he can't afford. He needs his edge to keep her alive. But as the killer closes in, anticipating every move he makes to keep Breeana safe, Sullivan wonders—who is the hunter and who is the prey? No I would not eat it! I am a VERY picky eater! Your book sounds interesting and I am looking forward to trying it out! Thanks for the giveaway! Um, yeah, absolutely no way in hell! I'm not a super picky eater, but I definitely like to know what I'm eating-- and there's certain things that just SHOULD NOT be mixed together. Albeit my fridge is pretty safe right now: some couscous & vegetables, some saffron rice, some salad, and fruit. Hey there! I seem to be technically challenged today and so far, I'm unable to reply to your individual emails. But thanks for entering for the giveaway, and I wish you the best of luck! Yes, I agree. I could NOT eat it, not matter how hungry, no matter who gave it to me. Not even if I was on Survivor and I could win immunity. I'm generally not a picky eater, but things have to be fresh and they have to smell good (really good) to be appetizing for me. 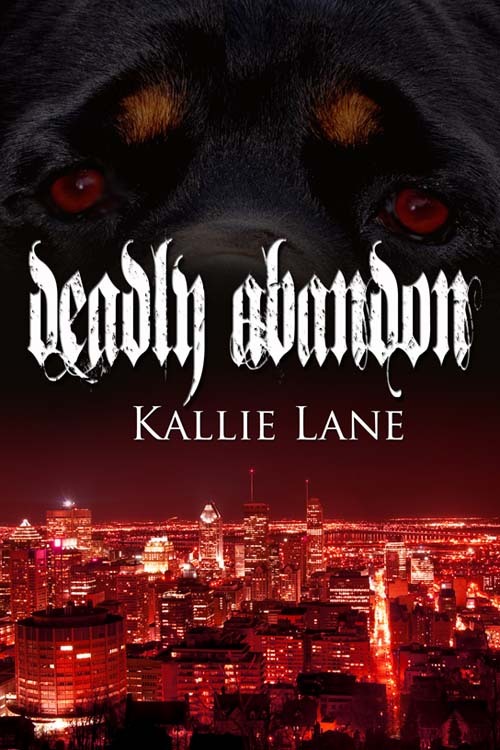 Looking forward to reading Deadly Abandon. I even added Dark Abandon to my list. They both sound like books I'd like. Thanks for blogging today. I always love being introduced to authors new to me. Hi Heather. Thanks for your comments and good luck in the draw! I am a picky eater and most definitely would want to know what it is... hunky man or not, I could not eat it unless I knew. Wow!It's great to meet new readers! As an FYI, this is the second book I've had published. DARK ABANDON is the first (Feb 2012) and they're both from the Shadow Soldier series. I get such a kick out of these guys. They're no holds barred tough when protecting the innocent, putty in the right women's hands, and funny at times, without meaning to be. Each book in the series will showcase a different member of the team. Thanks Colleen and good luck in the draw! Um, no. I would not eat slumgullion if it was offerd to me. I am a very picky eater so nope, I would not eat it. Your book, while it has a scary cover (good cover, but scary) sounds good. I do like romantic suspense! I haven't read any of your books yet so I'll have to check this one out. Thanks for the fun post. Thanks for your interest, Amy, and good luck in the draw! 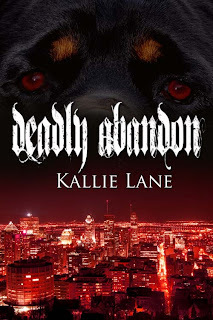 I hope my covers don't scare people too much, but I love them...Kim Mendoza is so creative, and each cover represents an animal in the book: in DARK ABANDON it's Dood, a wolf, and in DEADLY ABANDON it's Bruiser, a Rottie, both of them lovable characters, unless you give them reason to behave otherwise! I don't have any idea what is slumgullion. I need to see what it looks like and what it made of to even consider eating it. The ingredients in Sully's slumgullion don't sound bad, so I might taste it. Just had my coffee, and I'm awake, although my computer still won't cooperate - the Reply option isn't working for me and I apologize if I can't respond to every comment. Mary, I'm glad you enjoyed both DARK ABANDON and DEADLY ABANDON. The next book in the series is WILD ABANDON - Reece 'Rocket' Morgan's and Billie Bradshaw's story. It takes place in rodeo country and it's a wild ride for sure. No release date yet. No way in hell!! I'm not a real picky eater, but I do have my limits! Enjoyed the excerpt - the book sounds great. Thanks for the chance. Thanks for stopping by Martha, and good luck! I think perhaps if we were at Rachel Ray's house I might go for it, but so no way at mine LOL Thank you for the fun and making me smile today, as well as for the giveaway opportunity. Thanks for taking the time to stop by and post a comment Denise. I agree with you about Rachel Ray...I'd be game for anything from her fridge! I don't think I would eat it, not my kind of thing. Thanks for the chance to win. Hey crazy cat lady! I assume by your handle that you're a cat lover. I love my two and also have a couple of great dogs. Gotta love animals in my house! Your covers are all so interesting that I would like to read one of your books. Hi Jan. Consider it done, and I'm happy you like the book covers! Hmmm, rotting fruits and vegetables plus mystery misc from my fridge? - nope I don't think I'd eat it!